On March 16, 2016 three dozen women and men from The Pomegranate Guild of Judaic Textiles Toronto and Congregation Darchei Noam joined together at Darchei Noam for a wonderful evening of textiles co-presented by the two organizations. We were thrilled to see the Guild’s current exhibit “In Celebration” on display in the synagogue social hall, with our pomegranate grid hanging on one of the public feature walls and Melanie Siegel’s marvel hanging over the main stair. Wearing two hats – one from each organization – Sara Levine Petroff introduced our guest artist, Alice Vander Vennen. Alice is an artist of Dutch parentage who presented a slide show with comments, explaining how the methods and materials of her art are related to her life. Alice juxtaposes text with natural and found objects scavenged from many sources. She works intuitively with a strong basis in composition and colour. Many of the pieces are large and rich in deep colours 18″ by 50: some forming portraits. In other works, a canoe-like shapes of sticks and wire speak of journeys. Alice then led us through a hands-on session of collage and composition. She shared some of the tips and tricks that work for her: using a frame to test a composition, cutting and repositioning, reaching for “just the right detail.” At one point in the evening as she was teaching her technique she looked down at her clothing and cut a large button off the jacket she was wearing. Though we all gasped and held our own clothing closer to us we realized that for Alice, inspiration is everywhere. This was an evening of pure magic. Thank you Alice for allowing us a view into your own creative process. On a beautiful, cold, clear evening, Temple Sinai was ABUZZ with the excitement of creating 4″ x 6″ pieces of fabric into gift/greeting cards. Rikki Blitt introduced our own TallitMaaven and fabric design diva, Marilyn Cohen Levy, who presented power point slides showing her amazing work on cards, postcards that yes, go through the mail, and a variety of her other amazing projects. And, who knew what you can do with dryer lint! A plethora of ideas flowed through the evening. Marilyn generously shared an incredible amount of her stash so that we all took home several cards. This is pure mitzvah work allowing Marilyn to reduce her own stash and of course purchase more fabric. And I, for one, will never have to purchase another greeting/gift card. How lucky we are as members of this Guild to count such talent within our core. Reesa Wasser flew in from Florida baggage and all to thank Marilyn for all her work and for sharing her special talent with us. Certainly a night to remember! “GET HOOKED” – it’s not what you think! Continuing this year’s theme of “Do Not Waste”, Guild members and guests spent the evening learning about, and practicing, the art of “hooking” (or sometimes “prodding”). This event was co-presented and hosted by Congregation Darchei Noam. Our Guild secretary, Barbara Goldstein [see more about Barbara below], gave us a primer on (rug) hooking: she showed us stunning samples of her own work (bags, chair pads, cholent trivets) and then demonstrated how it’s done. The supplies are few: latch hook canvas, a crochet hook (or chopstick), and a darning needle. Then there’s the fabric: everyone grabbed their favourite from the Guild stash – chiffon, velvet, cotton, wool, etc. – and started tearing or cutting thin strips about 1 cm wide. With this technique, you start on the edge first. Fold back one row of the canvas and whipstitch or overcast using a darning needle threaded with a fabric strip. Then you use your crochet hook or chopstick to fill in the grid. “Hooking” uses a crochet hook to pull up fabric loops in each grid square. “Prodding” is done with a chopstick, to push loops down in the grid. The loopy side is the right side. Everyone had a great time tearing strips of fabric, hooking and prodding, and chatting. A tip from Barbara: you could “get hooked” on this technique and be tempted to go out and buy fabric, but remember – do not waste, use your stash! The Guild was delighted to be able to partner with Congregation Darchei Noam for this event, and we’ll be partnering again in March and May of 2016. A note about Barbara: Barbara is a graduate of Sheridan College and Nova Scotia College of Art and Design, Textile Studios, as well as an active member of The Pomegranate Guild of Judaic Textiles, Toronto. She has exhibited in many art shows, most recently “The Edge of the Forest”, now traveling across Canada. All completed work shown in this post are Barbara’s. What a lovely evening! What a lovely programme! What a lovely turnout! What an amazing group! Susan, already a fine artist in drawing, painting, and collage, shared her journey to fibre arts through pictures of her work. She told us how she got into fibre arts after cleaning out her late mother’s belongings. After grieving over her mother’s clothes for six months, Susan finally found herself able to do something with this new stash. So, she moved from painting to textiles to making tapestries of her mom’s remnants. She discovered through life that it is in fact the journey and not the destination. She fondly remembers a teacher who told her “…you will feel when its right”. And then, men’s shirts galore! We saw an incredible collage of men’s shirts, shirts taken apart with seams and buttons intact all quilted with polyfill. 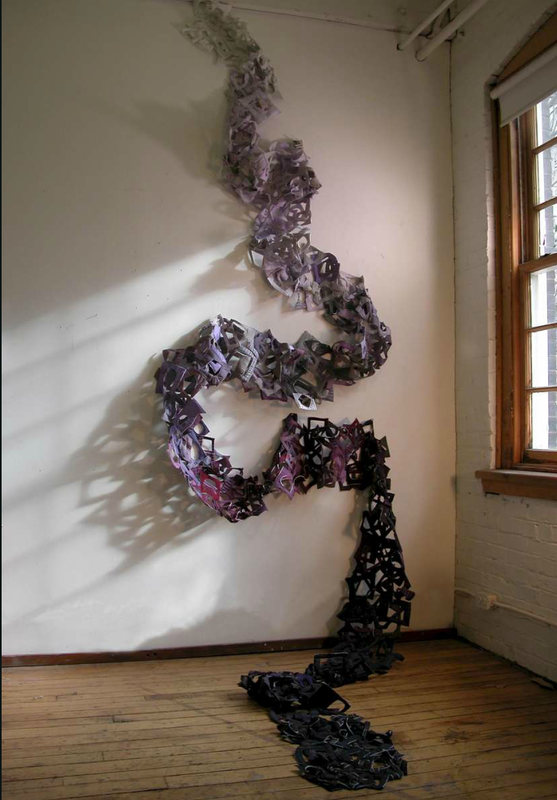 She works on smaller pieces and then sews them into larger works. Her goal, always, is to see what she can do with what is there. No, she is not sexist, she uses men’s shirts because of their uniformity of construction which lets her apply a system to their deconstruction. The evening became magical as we witnessed the transformation of trash to exquisite art pieces .created by a visionary with a deep concern for the environment. Thank you Susan for this memorable experience! Rikki then thanked her for a magnificent presentation and for kick-starting our year of Do not Waste and members had an opportunity to share from their own stashes. Our October meeting included a lesson in Japanese Furoshiki and a visit to Japan through the eyes of our President. Four women from the Japanese Cultural Centre came to tell us the history and to demonstrate the ancient Japanese art of Furoshiki, the use of textile squares for wrapping. Furoshiki refers to a flat folded bundle originally used to carry clothes back and forth from the bath-house. With current environmental concerns, there has been a revival of this old practice. The most common size of fabric for wrapping is an 18” or 24” square of fabric. A silk scarf is ideal for the purpose of wrapping, though other sizes and fabrics can also be used. There are many uses of Furoshiki including carrying, storage, gift wrap, wall hanging, tote bag, carrier for contributions to a pot luck meal. The squares are easy to maintain, eco friendly, easy to fold flat. The squares can be left as gifts or put in a pocket or purse to reuse. Our guests demonstrated the basic knot, flat object wrap, basic carry wrap, bottle carry wrap, hand bag, watermelon carry bag, and shoulder bag. We had an opportunity to try our skill at wrapping. 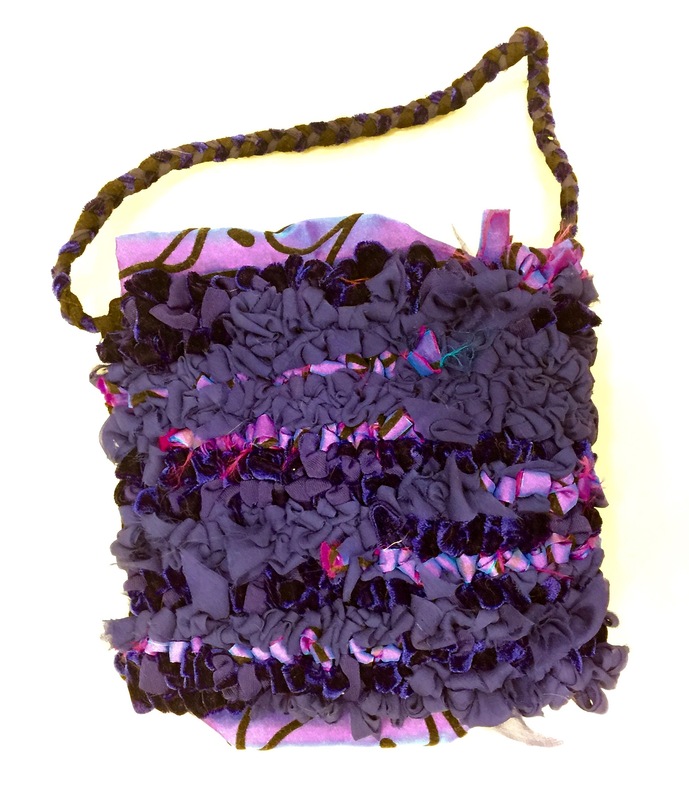 The art of Furoshiki is simple, elegant, useful and fulfills our mission of reusing and recycling beautiful fabrics. Nearly thirty years ago our President, Bruria, was young, single, teaching English and living in Japan. She found that it was easy to be Jewish because there was a synagogue and community centre, which included a swimming pool. Expatriate Jews gathered regularly for Shabbat dinners and for Jewish holidays. In a slide presentation, Bruria illustrated a number of Jewish subjects she encountered in Japan. These included a Japanese Yiddish Club, The Fugu Plan (a book telling the story of how the Japanese rescued Jews during the Holocaust), the story of Chiune Sugihara, who gave exit visas to Jews during World War II. There was a Jewish dentist, a Chabad branch with a mikvah and a Japanese man who had converted and become a Rabbi. There was a man with an excellent collection of Hebrew manuscripts and a Japanese pro-Israel group. The rest of the slide show illustrated the quirkiness of the Japanese. Bruria shared such interesting things to be found in the grocery store as bottles of diet water, hard boiled eggs in a tube, and sushi with “Hello Kitty” faces. She showed us a road going through a building and some of the many space saving devices like shoe drawers on the underside of steps or a combined toilet/sink. There were dogs dressed in kimonos, women dressed as dolls, and men dressed as women. These are just a few examples. Bruria had a good time in Japan, but we are glad she came back to us!